Democratized innovation is fuelling a new industrial revolution. Traditional brands need to disrupt themselves before someone else does it for them. Smart CEOs know that innovation doesn't happen at head office any more and it's not enough to have an internal R&D team rock up to SXSW each year to soak up the trends. If you think it's time to open source the company IP and collaborate with the startups before they disrupt the whole marketplace come along. 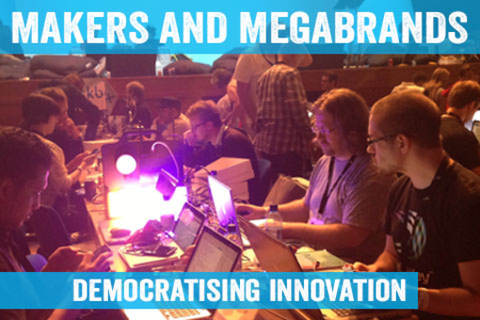 This is a meet up for hackers, makers, indie developers to hang out with the brand innovators and marketers and chat about the highs and lows of collaboration. David Caygill is a creative technologist and an innovator. Having been working the digital industries since it was called ‘New Media’ he’s had the opportunity to play a lead role in a wealth of award winning web apps, services and experiences. Highlights include the world’s first multi vendor flights aggregator in the 90s, a revolutionary collaborative eLearning platform, ground breaking mobile applications for Philips, getting London moving for the 2012 Olympics as well as and lots of fun with physical digital crossovers for Sony. He’s the creative tech and innovation lead within iris, one of the last global independent integrated agencies. His role is a mix of conceptual creative, technologist, optimist, pragmatic dreamer and generally to get overexcited about tech and people.